Time for another round of Yvo’s Shorties! This time around again two different genres… A non fiction book about books I’ve been wanting to pick up for a while and a MG read I decided to pick up on a whim. 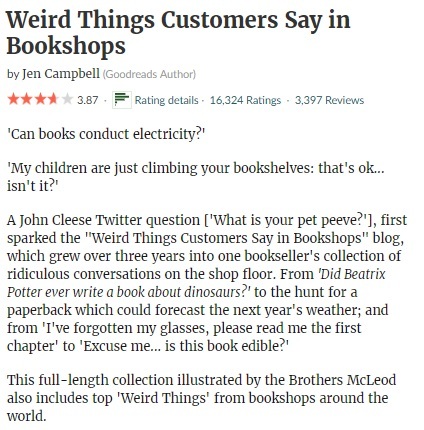 I love books about books and after reading The Bookshop Book by the same author back in 2016, I added Weird Things Customers Say In Bookshops to my wishlist. It took me longer than expected to actually get, but this was just the right book at the right time for me. This is the perfect book to use as a gift for anyone working in a bookshop or library, or any booklover in general for that matter! Fun, entertaining and full of weird situations that will make both your eyebrows raise and wonder what those customers were thinking when they opened the door to the bookshop that day… But at least it has given us this book to brighten up our day. I like how Weird Things Customers Say In Bookshops is divided into three different parts, with the last part being little anecdotes from bookshops around the world. It’s good to know there are weird customers out there in every little corner of the world… Although I’m not sure I would still want to work in a bookshop now. (Just kidding; I would still love to!) Remember this title if you are looking for something fun to gift to a bookish friend. I absolutely loved Every Last Word when I read it back in 2016, so when I was browsing my books the other day and Click’d popped up, I decided to pick it up on a whim hoping to add another favorite to the list. I didn’t realize it was a Middle Grade read before I started it, but I don’t think this has influenced my opinion in a significant way since it’s not the first time I’ve read and loved a MG read. Somehow, Click’d didn’t stand out in the way Every Last Word did, and I ended up feeling slightly disappointed. Click’d wasn’t a bad read and I really liked the idea behind this story, but overall I found the story to be rather bland. The plot has that geeky feel with two of the main characters creating an app/game and the whole progress of coding and dealing with bugs in the code plays a big role throughout the story. The other main theme is friendship, which could work really well, but there were just too many cliches for me involved. I don’t mind a cliche or two, but if there are just too many piling up it starts to get annoying and less interesting. Overall, I think Click’d lacks the little something extra that could have made this story into something wonderful. It’s not bad and without doubt a superfast read, but not the new favorite I was hoping for. The younger half of the MG age group might enjoy the story better though. 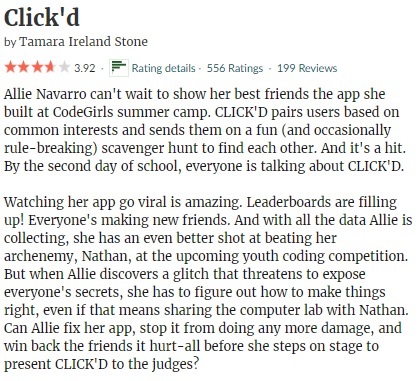 This entry was posted in 2018, 3 Star Rating, 4 Star Rating, Book Reviews, Yvo's Shorties and tagged 3 star rating, 4 star rating, book review, books about books, children, click'd, codegirls, contemporary, fiction, humor, jen campbell, middle grade, non fiction, published in 2012, published in 2017, realistic fiction, school, series, tamara ireland stone, weird things customers say in bookshops, Yvo's Shorties by Yvo. Bookmark the permalink. Love these shorties! I definitely want to get a copy of Weird Things it sounds like a fun read. It was without doubt a fun read! It’s incredible what some people ask or do in bookshops haha. I also love books about books! I need to pick up a copy. It’s without doubt a good one! I’m looking to pick up a copy of the sequel myself. 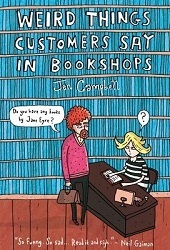 Especially Weird Things Customers Say In Bookshops was highly entertaining. 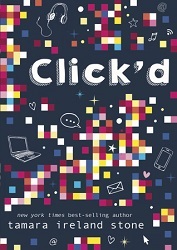 I’ve wanted to read Click’d for awhile now. I didn’t know it was middle grade until just recently. I’ve liked some middle grade books though. Great reviews!